Sandra has paintings in galleries and private collections worldwide, and now has a studio in Port Townsend, a Victorian Seaport known for its artists, musicians and wooden boat builders. She has had many paintings in juried shows and is the 2004 Wooden Boat Festival Poster award winner for her 1933 painting of the ARTHUR FOSS towing the WAWONA. She is heavily influenced by her father, the renowned Southern California artist, Craig Smith, as well as Arthur Beaumont, the navy artist, Sir William Russell Flint and John Singer Sargeant. Upon graduating from medical school, her father asked her if she was ready to take up some serious art studying after having fun all those years in school. He told her the only permanent things in the universe were the arts. While balancing a medical practice, she took his advice and pursued her interest in painting. Historic wooden ships along with the “Tall Ships”, are favorite subjects. 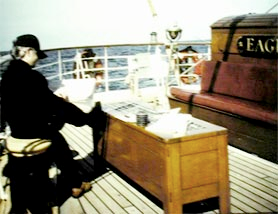 An avid sailor, she was the artist, doctor and a member of the Youth Adventures sail training crew aboard the 101’ schooner Adventuress in Puget Sound. The Baltic Sea Tall Ship race aboard the U.S. Coast Guard Tall Ship, the barque Eagle was also an inspiration for her paintings. She was the Eagle ship surgeon in 1996 and ships artist in 1997. She participated in the officer of the deck training (along with the Coast Guard cadets), for setting the sails of this square-rigged barque. Her painting of the Eagle is on display in the officer’s wardroom on board the ship and prints are given to visiting dignitaries on this America’s Ambassador Tall ship. 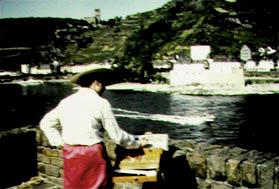 A six -year USAF tour of duty in Germany was an opportunity to travel and paint in Europe, including England, Germany, France, Italy, Denmark, Belgium, Holland, Czech Republic, Russia, and Turkey. Village scenes, cafes, vignettes of village life from the fishing villages in Cornwall, England to Prague, Czech Republic and Copenhagen, Denmark to Venice, Italy were just a few of the inspiring places in which she painted. Port Townsend provides the seaport and Victorian architectural subjects for many of her paintings, several have been featured in the Gathering Place calendar in 2003, 2004, 2006, 2007, 2008 and 2009. Watercolor is her love, with oils and pen and ink close behind. Sandra is influenced by the English School of watercolor and strives to obtain the maximum effect with the first stroke of the brush. This technique gives freshness to her paintings. Her palette is a balance of permanent transparent, opaque and dye colors. She strives to capture what the eye and the mind see and feel in a scene. Reflections fascinate her, be it a tall ship on the ocean or a rainy day with colorful reflections of people, flowers, or umbrellas. The interplay of light, reflections and shadows create infinite moods in which to lose oneself and provide endless subject matter. Suggestion, to let the mind fill in the rest of the detail, and to eliminate distractions as found in photos, is the key to a good watercolor. The painting of water, reflections and rainy days is always an intriguing challenge. The play of light in the clouds and on the water provides infinite variety to set the mood of a painting. Fortunately, she is blessed with a very supportive family. Her husband Dr. Mitch Poling, does Baidarka (kayak skin boat building), angyak (skin canoe) and they travel to Alaska to the Nucheck Spirit camp where she is the camp doctor and model kayak building teacher and has more painting subjects. Her son Andrew provides computer design and printing, and her daughter Victoria contributes excellent criticism, and helpful suggestions. She continues as the Medical Program Director for the Emergency Medical Services (EMS) of Jefferson County, West Olympic Peninsula, Olympic National Park and Navy Northwest of Washington State and continues to paint. She retired from the Air Force in August 2009 where she was the Medical Squadron Commander of the 446th Aeromedical Staging Squadron at McChord Air Force Base. As a Flight Surgeon she deployed to many parts of the world. Her participation in “Operation Deep Freeze” in New Zealand and Antarctica provided new inspirations for her paintings, including penguins on an ice flow and vignettes of Christchurch, NZ. Also 5 tours of duty to Spain have provided countless opportunities to paint. A trip to visit her daughter studying in China provided a whole new world of ideas and paintings.